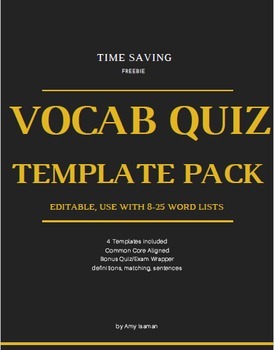 This packet includes four vocabulary quiz templates for use with word lists of 8-25 words. 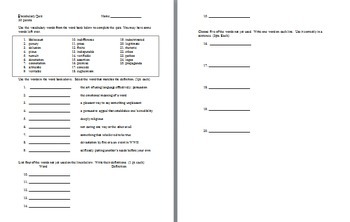 Fill in the word bank with your own words, add a few definitions, and it's ready to go. 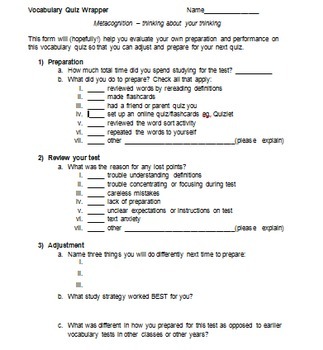 Also included is a bonus metacognitive "Quiz Wrapper" for use following a vocabulary quiz. This, too, is editable. Be the first to know about discounts, freebies and new products in my store. Look for the green star next to my store logo and click it to FOLLOW ME. Yay! You will now receive email updates about my store. Remember, if you enjoyed this hop back over to your My TpT Purchases page to leave 4 stars and a quick note! Thanks for visiting!